There are some notable new diesel options behind Kia’s refreshed best-seller, explains Alex Grant. The fourth-generation Sportage must have seemed like the proverbial ‘difficult second album’ for Kia. A bold new look for a nameplate which almost single-handedly transformed the brand’s image, from one of cheap city cars and caravan-movers, to a manufacturer of stylish, desirable SUVs. Thankfully, it’s shaped up to be a ‘Nevermind’ moment, vastly outperforming its predecessor. 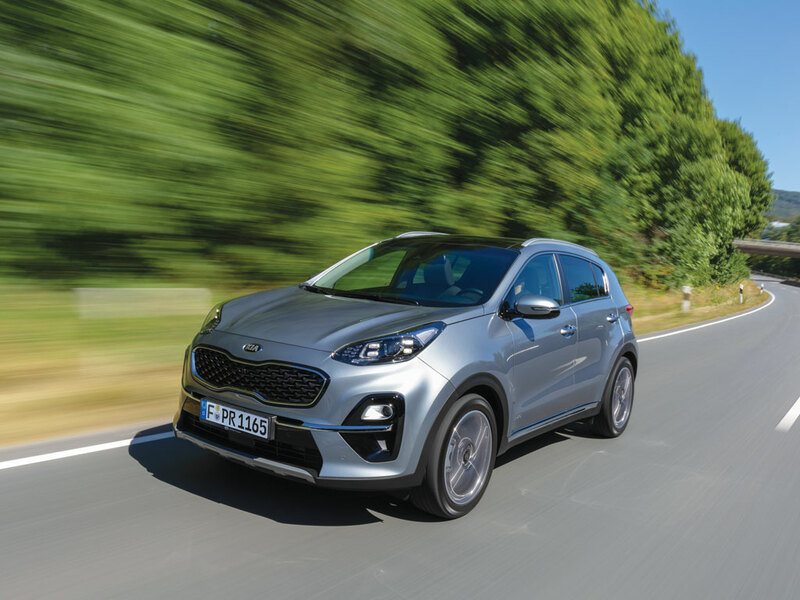 One in four Kias sold across Europe last year was a Sportage – some 131,000 units – and in the UK it’s now 40% of the brand’s volume. Demand isn’t slowing, with the smaller Stonic and Niro SUVs attracting conquests from other brands, and the broader new Ceed family out to follow suit. So mid-life updates amount to a double-disc special edition, in that the packaging is pretty much unchanged; new wheels, minor alterations to the grille and a chrome strip across the bumper that look a bit like a dental brace. Trim levels vary by market, but usually include four grades and a GT-Line version, with big wheels, sports styling and Porsche-like four-pod LED headlights. Standard equipment is generous across the range. All include reversing cameras and rear parking sensors, cruise control, and Android Auto and Apple CarPlay connectivity for mapping and messaging. Built-in TomTom navigation comes in at grade two, which is typically popular with fleets, while top-spec versions are well appointed enough to rival premium SUVs. Petrol engines are carried over, albeit now with particulate filters. Without the Ceed’s 1.0-litre three-cylinder, their baseline 159g/km CO2 emissions still offer limited fleet appeal in Europe. However, the diesel line-up is all-new, now featuring AdBlue injection to reduce NOx output. So the 1.7-litre and 2.0-litre units, favoured by fleets before, have been replaced with a new 1.6-litre unit, producing 115hp on the entry-level trim, or 136hp for the rest of the range. The more powerful of the two can be optioned with a twin-clutch automatic and four-wheel drive. This change means most business-bought Sportages will get a desirable power uplift versus the lacklustre 1.7-litre engine offered before. WLTP-derived ‘NEDC Correlated’ economy figures hide any real-world improvements, but the most efficient Sportage (a 1.6 CRDi 136hp manual) comes in at 4.8l/100km and 126g/km, and around €28,000 for a fleet trim. Unfortunately, it wasn’t available to test. Instead, we tried Kia’s new 48-volt ‘mild hybrid’ system, which is debuting here. This uses a motor-generator to assist the engine while it’s under load, and charges a compact 0.44kWh battery under the boot floor when it isn’t. The aim is to reduce the load on the combustion engine and enable it to switch off earlier while decelerating, powering on-board systems with the battery. It’s unintrusive and offers a claimed 4% economy boost, but the 1.6-litre diesel won’t get this system until 2020. For now, it’s only offered on the 185hp 2.0-litre diesel, with a twin-clutch transmission and four-wheel drive, which won’t make it a common choice. Changes might be limited, but they reflect a mature product. What’s here is enough to refresh the appeal of what’s already been a chart-topping car for Kia. Useful updates for a popular car, albeit not enough to be class-leading. Not that this has ever been a problem for the outgoing Sportage.